The winner of the hotly contested and very difficult to judge Caption Contest 40 and a custom black and white illustration by yours truly of whatever he or she likes is ... Fishpants! After a lot of mental wrangling I chose this one because a) just what the hell IS he a doctor of, anyway?, b) thinking it's in podiatry made me laugh, and c) the casual tone of the reply fit with the way the figure is standing and the gentle tapering of its fingers. Its fingers of DOOM!! Ed: FOOL! HOW DARE YOU DEFY — oh, yeah, I can hold…. Loki: No I don’t want to vote for him! leave me alone! Dave: 1) NO! Doom does NOT want to switch his long distance! 2) Doom WILL have two large pies with extra cheese! 3) Doom demands your supervisor! 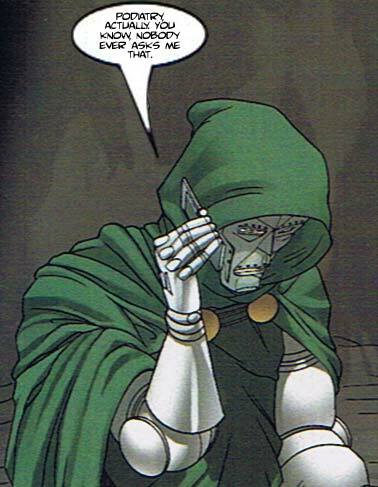 Doom did not spend $700 on text messaging! Meg: Alright, I’ve opened Control Panel, what do I do if it’s still flashing? Zincspider: Stop calling Tony… Yes, your movie was better, I don’t care… are you drinking again? Timespike: Hello and welcome to the supervillain hotline. This call may be recorded for quality purposes. For account information, press 1. If your doomsday device is malfunctioning, press 2. If the heroes are knocking on your door, press 3. If your costume is out of date, press 4. If you need to rent more minions, press 5. If you need to punish the fools, press 6. If you need help deciphering ancient tomes, press 7. If your second in command is in league with the heroes, press 8. If your army of mind-controlled giant robot ant-sharks with laser beams on their antennae has stopped working, press 9. For all other calls, press 0, and a representative will be with shortly. Your call is important to us. I think Dave best nailed the way Doom would actually talk on the phone. I liked Meg's line because it made me imagine myself getting Doom on the phone back when I worked tech support for Dell and ... ouch. But they were all good in their way, and I thank everyone who submitted an entry. Nice job everyone! Check back in the next little while for Caption Contest 41 and your chance to win your own custom black and white illustration of whatever you like (within reason)! Yep, for a total of five years off and on. Cool. I acctually made it into the honorable metions! WOOHOO! But yeah, I always he had a PHD in EVIL!… or Euthanization. Also, The win is well deserved. That is hillarious.